Dragon Boat Festival, also called Duanwu Festival (Solar Maximus Festival might be a more accurate literal translation of 'Duanwu' in English), Duanyang Festival, May Festival, Summer Fesitival, Poet Festival, Flagleaf Festival, is one of the oldest Chinese traditions all over the coutry. Why is Dragon Boat Festival called Duanwu or Duanyang Festival in China. Dragon Boat Festival or Duanwu Festival occurs on the fifth day of the fifth lunar month (which falls between the last 10-day period of May and the first 10-day period of June). It is reckoned in accordance with Chinese lunar calendar based on months consisting of 29 or 30 days, whereas the actual summer solstice is determined according to Gregorian calendar reckoning (where months have 30, 31, 28 or, in leap years, 29 days). In traditional China, the sun (Yang) is considered to be the strongest around the time of summer solstice ("mid-summer", but "beginning" of summer elsewhere) when the daytime is the longest in the northern hemisphere. Yang (sun), like dragon in Chinese myth, is considered to be male; whereas Yin or yue (moon), like feng huang (mythical Chinese phoenix bird), is considered to be female. Summer solstice is male whereas winter solstice (longest night of the year in the northern hemisphere) is female. So it is natural to venerate the male dragon at the time that the sun is at its maximal strength, that is, at duan wu. the Double Fifth was traditionally referred to as "boys day", although this was changed to "children's day" around 50 years ago. The Yin-Yang (shadow-light) theory, symbolized by very familiar Taiji Diagram (Diagram of the Supreme Ultimate), reflects the traditional Chinese world view of the duality of forces. The similar view was widely applied to many fields of Chinese social life. For example, it is part of Traditional Chinese Medicine (TCM) theory. The use of herbs and plants, realgar wine, mugwort, etc. to ward off evils during the height of the summer heat around the time of dragon boat races and duan wu reflects TCM concepts as well, which are founded on Daoist traditions of "alchemy". The dates for current and next year are 8 June 2008 and 28 May 2009. The Duanwu Festival is believed to be originated in ancient China. There are a number of theories about its origins. There are also a number folk traditions, beliefs and explanatory myths connected to the observance. Today, the best, most widely accepted version is that the Duanwu festival originated in memory of the patriotic poet Qu Yuan (340-278 BC) who lived in the Chu State during the Warring States Period (475-221 BC). Qu Yuan - The best-known traditional story holds that the festival commemorates the death by suicide of poet Qu Yuan, a Confucius scholar and minister of the ancient Chu state during the Warring States period. Qu Yuan, a descendant of the Chu royal family, served in high offices in his state. He wrote influential Chinese literary works like 'Li Sao', including poetry. He is commonly referred to as a a great patriotic 'poet' and a 'statesperson'. works in literature. However, he is more properly considered as a ministerial Confucius scholar. Qu Yuan always put forward policies and encouraged the king of Chu to make his state stronger independently. 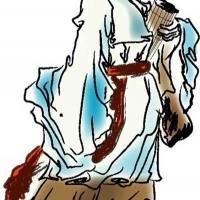 Qu Yuan' measures were carried out and his state become thriving and strong. Unfortunately, the good time did't last long. He was entrapped by evil speech and dismissed by the king because of his action against alliance between Chu state and Qin State. During his exile, Qu Yuan wrote a great deal of famous literary works to express deep worry about his state. Qu Yuan's worry was proved to be right. Twenty-eight years later, Qin conquered the Chu capital. In despair at not being able to halt the decline the state, he drowned himself in the Miluo Rover on the fifth day of the fifth lunar month. Heard Qu Yuan's suicide, the local people who admired his patriotic action rowed their boats out onto the river to search for his corpse. At the same time, some people threw food into the water to prevent Qu Yuan's corpse from being eaten by prawns, fish and crabs. Wu Zixu - Despite the modern popularity of the Qu Yuan origin theory, in the former territory of the state of Wu the festival commemorated Wu Zixu (526 BC - 484 BC). Like Qu Yuan, Wu Zixu was a loyal advisor whose advice was ignored by the king to the detriment of the kingdom. Wu Zixu was forced to commit suicide by the king Fuchai, with his body thrown into the river on the fifth day of the fifth month. After his death, Wu Zixu was revered as a river god. 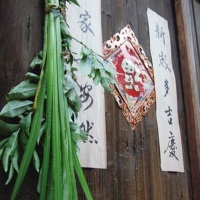 The local people used the ways (similar to that people used for Qu Yuan) as sacrifice ritual to worship the river god. In places such as Suzhou, in Jiangsu province, Wu Zixu is remembered during the Duanwu Festival to this day. It is said the the food the people threw into the river water is the origin of Zongzi (Chinese rice dumplings). It is said to be the origin of dragon boat racing that the local people were paddling out on boats onto the the local river. that is what the Chu people used their ways to offer mourning to Quyuan after his death. The date and the ways were developed into a custom, troditiona and festival now. Modern researchers have theorized that the commemoration of Qu Yuan or Wu Zixu were superimposed onto an existing holiday tradition, but has subsequently overtaken the original significance. More people agree that traditional rituals of the Duanwu Festival represent offerings to the Gods and worship of dragon king and mostly relate to avoiding diseases and luck blessings in Chinese culture. How to Celebrate Dragon Boat Festival in China? When the Duanwu or Dragon Boat Festival comes, Chinese people go on some most widespread activities on celebration. 1. Dragon Boat races is the most attractively exciting activity for celebration of the festival. The races will be held on the rivers near local villages and town and always draw a lot of audiences. 2. Most of housewives are to prepare zongzi at home. Zongzi fiiled with various ingredients offer a good taste for the festival. The people drink some medicated liquor like realgar (king's yellow) wine for health. 3. The leaves of flagleaf and argy wormwood are kept hanging on the upper corner of doors and windows for days, which are designed to ward off disease or evil from the house. 4. Pictures of Zhong Kui (mythical guardian against evil spirits) and Joss paper with spell are sticked to doors for a wish of blessings. 5. Pretty Chinese knots, little aroma pouch are given to Children for luckiness. 6. Swing and more popular game are playing near houses. Dragon boat race and Zongzi eating are the most widespread througout the country. That is Must-do things. And other activities and game are of some local difference. Zongzi - How to make Chinese Zong zi? Zong zi is the traditional food for the Dragon Boat Festival in China. You may see zongzi in different shapes like most popular triangular and pyramidal. 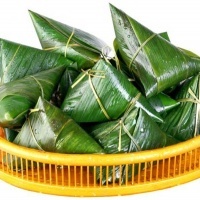 Zongzi is a special kind of dumpling with a variety of fillings wrapped in bamboo leaves. It is usually made of glutinous(sticky) rice. The fillings can be pork, egg, beans, dates, fruits, sweet potato, walnuts, mushrooms, meat, or a combination of them. Fresh bamboo leaves are the best for the wrapping since the taste and smell of the fresh bamboo leaves is part of zongzi. How to make Chinese Zong zi step by step? 1. Cut the pork into the right shape, wash and peel off the mung beans, pit the dates and the like, and set them on some plates on the table respectively. 2. Use salt, sauce, preserved beancurd and more you like to flavor the pork and the mung beans and keep for an hour in advance. 3. Wash glutinous(sticky) rice and flavor it with salt and edible oil in an bigger container. 4. Wash and boil the resh bamboo leaves and flexible plant rope with water for muninutes until it is soft. By far, that is everything you should do before you start to wrap something. 5. With apron on your knee, you can sit down to start. Two or three pieces of bamboo leaves are piled up to wider on your palm, use a spoon to put the glutinous (sticky) rice on the leaves as a pad, set pork and mung beans and more, then a layer of rice on the top, at last a piece of leaf as cover and are furled with the leaves below into a pyramidal shap, bundle it up with grasslike rope. That wrapping work is finished and again. 6. If you want to wrap it into triangular shape, the order of working is little different with techniques. Before wrapping, the leaves are furled into a tundish shape at first. Then hold it with your hand (not on plam) while you are use the rice and other ingredient to fill it. Once the filling is finished, the leaves are furled again to the shape. More tips are required for it. 7. Check it, the wraps must be bundled up firmly before you have them boiled or steamedf for a long time untill they are fully bulged. 8. Keep in mind that the size of wrapped zongzi depends on the width of the folded leaves, and how much rice and other ingredient should be filled. In China, zongzi is closely associated with the festival and celebration, which has more good wish - hit it ! when someone does something. Moreover, zongzi on Dragon Boat Festival reminds Chinese people that the importance of loyalty and commitment to the community because the festival is in memory of the great patriot poet, Qu Yuan. 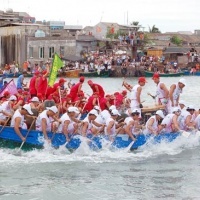 Dragon Boat races are the most exciting part of the Dunanwu Festival. On the river, Dragon boats, like a cluster of flying arrows, are marching on following fast paddling, drum and shout in order. The grand view always draws crowds of spectators along the riverside. Dragon Boat - A dragon boat or "dragonboat" is a very long and narrow, canoe style human-powered boat now used in the team paddling sport of dragon boat racing which originated in China over 2000 years ago. Dragon Boats are generally brightly painted and decorated canoes. Ranging anywhere from 40 to 100 feet in length, their heads are shaped like open-mouthed dragons, while the sterns end with a scaly tail. Depending on the length, up to 80 rowers can power the boat. A drummer and flag-catcher stand at the front of the boat. Before a dragon boat enters competition, it must be "brought to life" by painting the eyes in a sacred ceremony. Races can have any number of boats competing, with the winner being the first team to grab a flag at the end of the course. For competition events, dragon boats are generally rigged with decorative Chinese dragon heads and tails. At other times the decorative regalia is usually removed, although the drum often remains aboard for training purposes. In some areas of China, the boats are raced without dragon adornments. The standard crew complement of a contemporary dragon boat is around 22, comprising 20 paddlers in pairs facing toward the bow of the boat, 1 drummer or caller at the bow facing toward the paddlers, and 1 sweep or tiller(helm) at the rear of the boat, although for races it is common to have just 18 paddlers. Dragon boats vary in length and crew size will vary accordingly, from small dragon boats with 10 paddlers, up to the massive traditional boats which have upwards of 50 paddlers, plus drummer and sweep. The drummer or callers may be considered the "heartbeat" of the dragon boat, and leads the crew throughout a race with the rhythmic beating of a drum to indicate the timing and frequency of paddling strokes (that is, the cadence, picking up the pace, slowing the rate, etc.) The caller may issue commands to the crew through a combination of hand signals and voice calls, and also generally exhorts the crew to perform at their peak. A caller/drummer is mandatory during racing events, but if he or she is not present during training, it is typical for the sweep to direct the crew. The paddlers sit facing forwards (unlike aft-facing seated rowers), and use a specific type of paddle with distinctly different craft. The craft stresses in order and lead by the strokes of the drummer. Dragon boat race has taken place annually for more than 20 centuries as part of folk ritual. The competition is traditionally held as part of the annual Duanwu Festival observance in China. Today, annual dragon boat races take place in many areas of east Asia with significant populations of ethnic Chinese living there e.g. Singapore, Malaysia, and Greater China. Dragon Boat Festival or Duanwu, referred to as the 'double fifth', is the term that has become internationally known in the West. Book a China tour for Dragon Boat Festival! 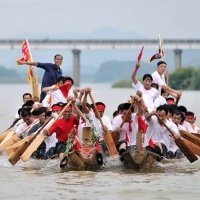 Where could I go to watch to Dragon Boat Races near GuShi, China?